Paul Annacone is a legend in the world of tennis. He has coached many of the greats, like Roger Federer and Pete Sampras, among others, and as Roger Federer wrote about his relationship with Annacone, “The pursuit was often difficult, but in the end, when you achieve your goals, it makes all the hard work pay off…” Lauded by tennis stars from Pete Sampras to Chris Evert to Martina Navratilova to Tracy Austin and Tim Henman, Paul Annacone is the quiet force behind 21st century tennis-coaching philosophies, habits and lessons. 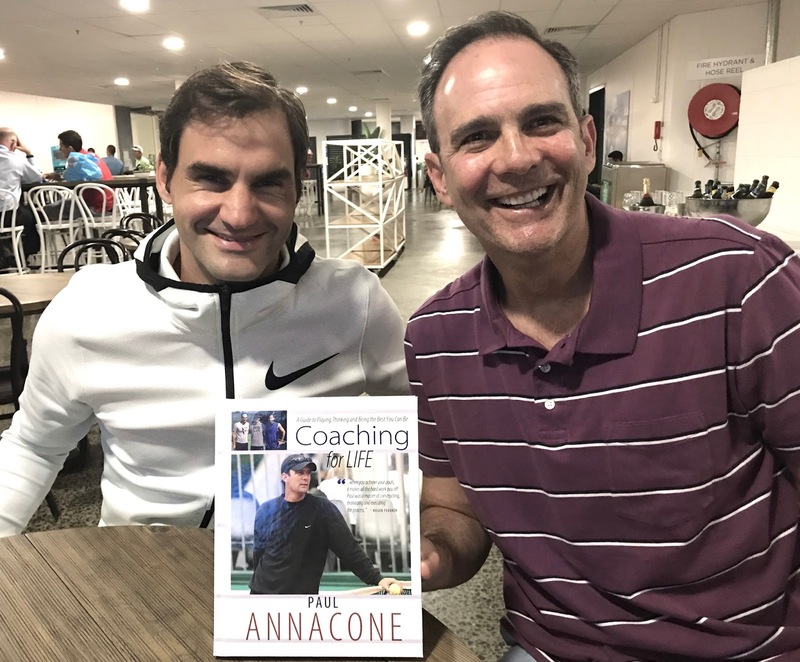 Stay Thirsty Magazine was honored to visit with Paul Annacone about his new book, Coaching for LIFE, while on his trip to the 2018 Australian Open with Roger Federer, who earned his sixth Australian Open victory a few days later. STAY THIRSTY: In your book, Coaching for LIFE, you focus on the concepts of Process, Power of Belief and the Positive Sense of Inevitability. How did you arrive at those three ideas and what have they meant in your life? PAUL ANNACONE: I used my past experiences as a developing player, then a competitive player, then a tour player, combined with my coaching experiences, to formulate my philosophy. I have been very fortunate to have coached some of the most accomplished male players in the history of the game. Although their personalities are different, there are some very clear commonalities that allow their talents to shine in the biggest moments. I feel these traits are transferrable to many professions and to life in general. That was the genesis of this book and it built from there. These processes and this philosophy have really helped me deal with adversity in life and helped me be more pragmatic, empathetic and mindful as life happens. STAY THIRSTY: Although you have written a book based on your experience as a tennis coach to some of the greatest professional tennis players, like Pete Sampras and Roger Federer, your tennis philosophy seems to be transferable to life in general. How do people outside the world of tennis react to your advice? 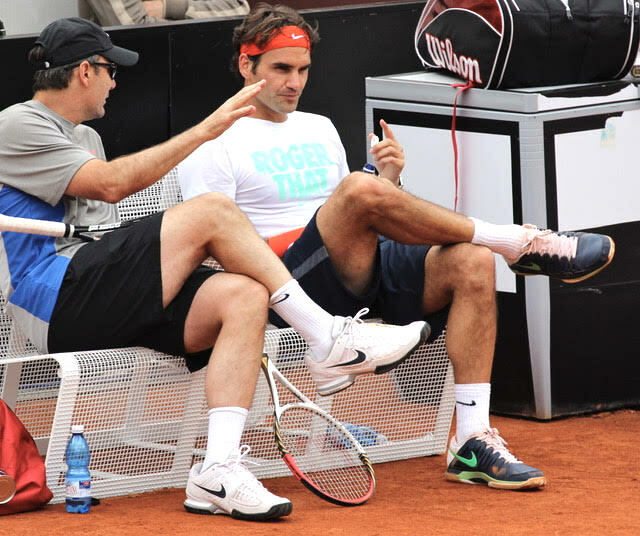 PAUL ANNACONE: I live in a collaborative environment so I am very fortunate to continue to learn from so many people. Every tournament I have conversations and dialogue with very successful people on and off the tennis court. We all seem to share philosophies and ideas that help formulate our individual beliefs and pathways to success and happiness. I have had terrific reaction to my book and the philosophies it discusses. I'm very happy about that. STAY THIRSTY: In your book you make it clear that when there is adversity, one must adjust and adapt. In your life, how has that philosophy helped you? PAUL ANNACONE: It has helped incredibly; given me terrific perspective and understanding that "things happen." It is all about how we choose to react to those things that define us and build the foundation of how we deal with life in general. It is important to feel emotion and use the emotion in positive ways. That has helped me immensely. STAY THIRSTY: You organized your book into sections like: Power of Belief; Spirit of Belief; Maximizing Your Potential; and, Positive v. Negative, just to name a few. How do you view each new day personally and what is your antidote to difficult times? How do you maintain your view of the “big picture” when the going gets tough? PAUL ANNACONE: It is so cliché but so true: "Every day is a new opportunity!" I believe that and try to live it; try to enjoy and embrace whatever that day is. Sometimes it is a great, optimistic day, other days there are challenges. You have to embrace, evaluate, digest, then choose how best to proceed. Sounds easy, but it often isn’t. So I try to make optimistic choices and decisions that can help my quality of life. STAY THIRSTY: Do you personally feel a sense of destiny or inevitability? PAUL ANNACONE: I really do. I believe things happen for a reason and I feel personally that I have been incredibly fortunate. I am thankful for that and try to set up my environment so that it makes it more likely for good things to happen! STAY THIRSTY: What role does the control of emotions play in the life of a professional tennis player? What ideas do you bring to the table to deal with the winning-and-losing nature of the sport? PAUL ANNACONE: The tennis arena is about you and the person on the other side. It is an emotional environment, so it is vital to manage those emotions to use the positive ones to drive you. You have to be able to digest what’s happening and problem-solve in real time. And you are doing this in isolation. I love that dynamic. It says so much about the person and how they deal with adversity. You can learn and build from this regardless of where you are in each moment. I love the possibility to grow and get better. Let’s be honest, life in general is a journey, so you better keep learning and enjoying because your personal environment evolves and you better be able to as well. STAY THIRSTY: As you look back at your career as a professional tennis player, did you ever think you would reach a career high ranking of No. 12 or did you think you could have gone all the way to No. 1? How did you adjust to the idea that being the top tennis player in the world was not going to be your fate? Do your aspirations live through your pupils like Pete Sampras and Roger Federer? PAUL ANNACONE: My achievements really fit my skills. I think I did well to get to #12 in the world, I wasn’t better then that in the "macro," so I am proud of what I achieved. In retrospect, you can always do things differently to improve, but I don't really think about that much because I am very happy with the level I achieved. I had to learn in order to help the greats, understand their personalities, environments, their expectations and their processes. You have to listen. You have to be a sponge of sorts to get better and to fully grasp things. And guess what, things change! You formulate your way of assisting, but the dynamics change and are as fluid as are the personalities. So you have to think on your feet and embrace each opportunity. I have loved them all. STAY THIRSTY: If you could do one thing over again in your career, what would it be? If you could repeat one moment, what would that be? PAUL ANNACONE: I would take better care of my body in terms of rest recovery and maintenance. I was fine with my training but did not understand the importance of physical and mental recovery; that’s part of the evolution of sports science as well. You can never get the same feeling of competing on a major court in a significant event – any of those feeling I would repeat – they are magical and fuel for the soul.